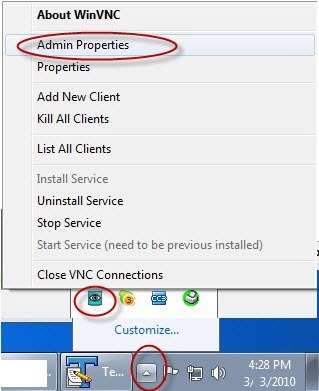 On some PCs when using VNC to remote control a machine with some transparent windows or Office 2007 you may notice that the Office Button menu (top-left corner, main menu) does not display when using ShowMyPC Service. The menu displays on the local machine but does not get transferred remotely. If you install the UltraVNC hook driver, it works just fine. Step 1) Download the driver here and run it. Note: If installing this driver while connected, the VNC connection will be terminated and the machine/service will need to be restarted. 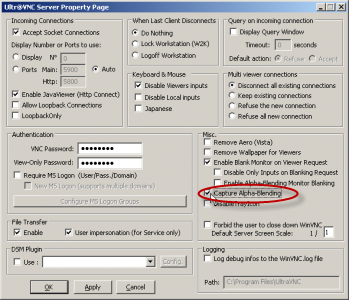 Step 2) There is a setting under 'Admin Properties' on the server. It's called 'capture alpha-blending' and should be enabled. To get to these settings, right-click on the System Tray icon and go to Admin Properties. Check the 'Capture Alpha-Blending' setting under Misc. and then hit Ok.